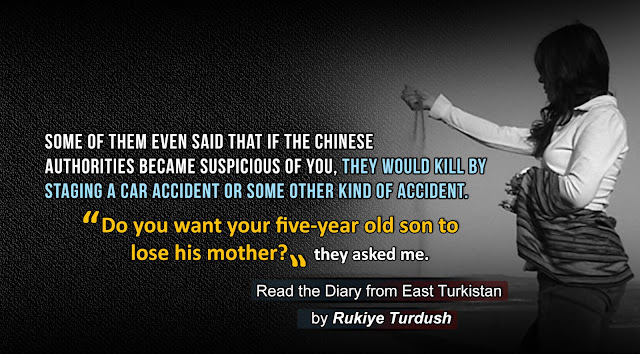 Note: This Diary was written by Rukiye Turdush while she visited East Turkestan ( illegally known as Xinjiang) in November 2003. The present situation has only got worse for Uyghurs living in East Turkestan now. I had left my country almost four years before. In the summer of 2002, one of my friends introduced me to a journalist who was interested in making a documentary film about my country, East Turkestan. He was looking for someone to accompany him but I could not find the right person for him, and so finally I decided to go with him myself. Coincidentally, I had been eager for a long time to travel every inch of my motherland as well, given that I had never been to any other cities in East Turkestan other than Gulja and Urumqi. However, all of my close friends and family members, including my parents, disagreed with my decision. All of them thought that it would be a very dangerous trip for me. Some of them even said that if the Chinese authorities became suspicious of you, they would kill by staging a car accident or some other kind of accident. “Do you want your five-year old son to lose his mother?” they asked me. I was hesitating a little bit but I did not want to change my mind and believed what my gut feeling keep telling me : “ If everyone had been scared about taking risks in the past, no one would have ever done anything meaningful.” I staring at mirror, The young women’s face on the mirror smiled at me, she look calm and serious. I left front of the mirror, my 5th flour bedroom window was wide open, white cream color curtains are slightly moving through September’s mild wind. Outside was beautiful, I can see the red maple leaf threes and busy cotedes neiges street from the window. cars are slowly running out from Timhorton’s drive thorugh way at the corner. People from different origin are staying on the line in the the bus stop front of my apartment building, when the bus arrive they politely smiled each other and yielded each other. There is no excuse for anyone to plead that he cannot do well or was forced to do evil by his circumstances and surroundings, or by the fact that he lives in evil times. We must shun evil and seek well. The creation of Allah is vast enough to enable us to do so provided that we have the will, the patience, and the perseverance. If we look at the animal creation we see many creatures that seem almost helpless to be able to find their own food or to sustain their full life, being surrounded by many enemies, yet in the plan of Allah they find full sustenance and protection (translation of the Holy Koran by Abdullah Yusuf Ali). Those words swept away all of the worries from my head. “God stays with people who fight for justice”, I said to myself. As soon as I obtained my Canadian passport, I left for my motherland with French journalist and with feelings of hope and confidence. As the journalist and I traveled by train from Beijing to Urumqi by train, I had a conversation with a Chinese man from Beijing. He was staring at me with his small eyes with curiosity as all other Chinese do when they see the foreigner. I had no doubt that he was a middle class government worker due to his yellow stained glass tee bottle that Chinese government officials used to keep in their office table. “What a boring trip” I said in Chinese on purpose to open conversation with him. How come do you speak Chinese? He smiled with surprise. “Beijing never feels secure and always worries about Uyghurs”, he said to me once he knew that I was Uyghur. “Why?” I asked him, pretending not to understand anything. “Maybe they couldn’t find a way to survive and married Chinese men just to be able to live, but I don’t believe those are real marriages,” I said. “Because they have an independent country, you forgot that part!” I said, filling out his statement, but quickly realized that I am going farther in the sensitive subjects that can cause suspicion. I left for a walk inside the train, and passed hard chair wagons: dirt, along with stenches was everywhere, tired people are sleeping under chairs appearing as if they were dead. It was impossible to walk through; Chinese passengers were stepping across them. “Oh, No!” I said, and didn’t go any further; I just stayed beside the door step and started a conversation with a Chinese woman who was carrying two babies, and was just sitting on the empty space on the floor, front of a toilet with her husband. “American?| Ask her husband surprisingly with a Shandong accent. -But they have some brown hair too..
People around him start to argue and tried to guess where I was from. -How come she does not have blue eyes? -You crazy guy, I saw too many Americans with brown eyes and yellow eyes, she must be American! I felt dozens of small eyes and flat faces pressed around me and I was very uncomfortable with that much attention, I wanted to escape right away, but I didn’t since I was curious as much as they curious about me. “I know that there is a one child policy in China, but how come you managed to get two kids?” I said to the Chinese woman, while ignoring the curious faces. -How come she speaks Chinese!? -Wait a minute, maybe she is from Xinjiang, she is not just telling us the truth, Uyghurs look like foreigners ( lao wai). I know that..
- We heard that we can have a many kids over there , government policy toward Chinese immigrants were very loose and beneficial. You can hide and can get as much as kids you want. Also Xinjiang is very rich place, easy to make money..
- But, I heard that lot of unemployment among Uyghurs in Xinjiang, how could you sure that you can find a job? I interrupt them. - Government help us find a job, Xinjiang people are wild and lazy, they don’t work. we have to go to develop Xinjiang. - So, your guys just like Xinjiang but do not like the people? I ask again. - Yes, because Xinjiang people are mainly Uyghurs, they are totally different from us, looks like foreigners, they don’t eat pork, because pig is their ancestors and they pray to pig. - No, I know that, they don’t pray to pig, pig is not their God. Mohammad is their God, they start to argue again. - “ Wrong! Mohammad is not a God of Muslims and pig is animal, can’t be ancestor of Human!” I sharply break the conversation. I couldn’t control myself, I am totally pest of. I don’t know were they got those crap. Are they trying to create bad image of Uyghurs, so saying with purpose? Or they were misinformed by the government ? it was not clear….